We’ve discussed Ozone Socks on our Sock Clubs blog in the past. But recently, Ozone has launched an updated website with fresh sock designs that will enhance your footwear game. What’s different about Ozone Socks compared to other online sock websites? Ozone has superb quality — they partner with family owned mills in Columbia, France, and Japan — giving them a direct, diverse supply line of quality cottons, wools, and nylons for your feet! Ozone has been around since 2000, so they have had almost two decades of design experience — leading to innovative patterns for both men and women. Their novelty sock collection is worth checking out — designs such as “Boot Knife” and “Mosquito Squadron” effectively guarantee a unique style in the office or when out with friends. And of course, Ozone Socks has a sock of the month club. 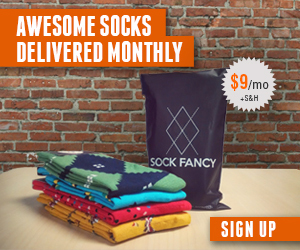 When signing up for their sock subscription, you choose whether its for men or women, and select a 6-month or 12-month plan. They send you a new pair each month, and shipping is entirely free. For an online sock store, Ozone Socks is as reliable and cool as any. You can pick from buying single pair designs of your choice, or subscribe to their monthly sock subscription. Shipping is free, the designs are novel, and the service is top notch. With the NBA All-Star weekend at hand, the most appropriate pair of socks to wear are the official socks of Dwayne Wade, which are exclusively available on Stance.com! Dwayne Wade is a top NBA player, and his personality shines in this sock collection. Prices range from $14 – $16 per pair, and you won’t be disappointed with the designs. His collection contains over 40 different patterns, ranging from the black and white “Camp Grey” pattern socks, to the more elaborate beach-themed “Clemantine” pattern. Show your love of the NBA in style this all-star weekend with a pair of socks from Dwayne Wade’s sock collection! Stance is one of the most well known emerging brands for buying socks online. The Stance website features socks for people of all kinds – socks for men, socks for women, and of course, socks for kids. They also feature celebrity-endorsed sock collections, such as a Beavis & Butthead sock collection, NBA socks, and their “punks and poets” celebrity endorsements from leading celebrities such as Rihanna and Big Sean. So what is so exciting about Stance socks? Obviously the celebrity endorsements and collections are awesome. But they also have unrivaled sock quality. Their socks are made of Merino Wool, Supima Cotton, or Cashmere. And they are all hand-dyed. If you are looking more for Athletic or Performance socks, Stance can also suit your needs. For men, they carry Underwear as well, and performance, casual, and premium socks. This holiday season, you can get free shipping from ordering socks online at Stance.com when you place any order greater than $50. So get your feet game together and buy some socks from Stance! Buy socks online at the Tie Bar! The Tie Bar is a well known site to buy high quality neckties online for a good value. Did you know that the Tie Bar also carries men’s accessories, including socks? We certainly did! (well, that’s partly because we run SockClubs.com – the online resource for all things sock buying online!). Check out The Tie Bar for stylish, celebrity endorsed men’s accessories starting below $20. Their styles are slick, and they have tie of the month and sock of the month clubs that you will love.